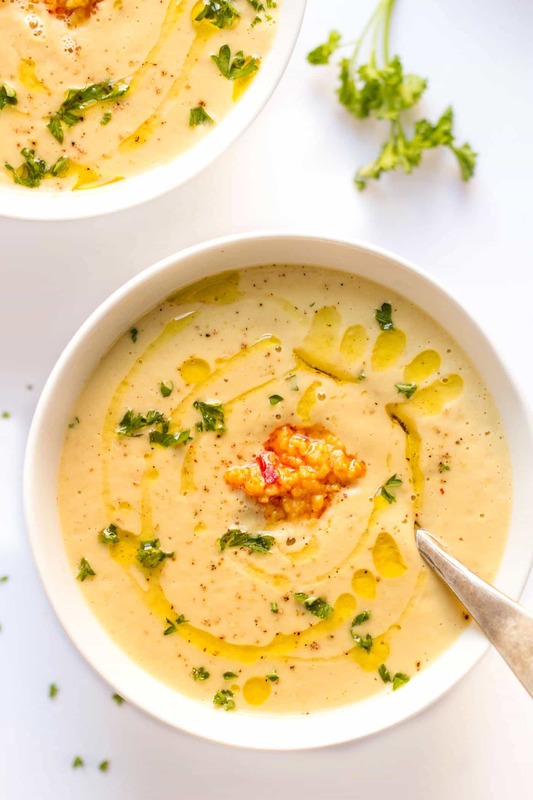 This quick cauliflower chowder is made in only 30 minutes, is filled with roasted garlic flavors and it's high in protein so it's satisfying and healthy! A snow storm in NYC yesterday and I missed it. I’m SO bummed. Being in the city when it’s snowing is magical. It gets super quiet – there’s practically no one walking around and the streets are almost empty. It’s like the city goes to sleep. Luckily, having Trevi makes us get out and experience the peacefulness. And even though neither of us feel like bundling up and bracing the cold, her excitement when her paws hit the snow is worth it. She LOVES the snow. Like I’m not even kidding you, as soon as we let her off leash in the park, she’s like the Tasmanian Devil bombing around trying to dig for sticks and chasing every dog she sees. She’s definitely a winter creature. Her parents on the other hand? Not so much. We’d much rather be snuggled on the couch watching a movie and eating a bowl of soup. Or if it’s a Sunday, watching football (and yes, still eating soup). Typically, I’m a fan of chili when it’s game day. It’s easy to make in the slow cooker and is one of the few meatless meals that Matt enjoys. Last weekend though I was in the mood for something smooth and creamy, which is how this cauliflower chowder was born. Problem is, Matt isn't the biggest fan of pureed soups, so I knew I was going to have to doctor the flavor up a bit so it would appeal to him too. We’re both garlic lovers, and since I was already going to roast the cauliflower, I figured why not add some garlic in there to add flavor. Along with the roasted cauliflower and garlic, I also tossed a small potato on the pan which gives the chowder an even creamier texture. My other secret to this soup? Roasted garlic hummus. Yep, hummus. In your soup. Don’t be weirded out because it’s actually SO good. 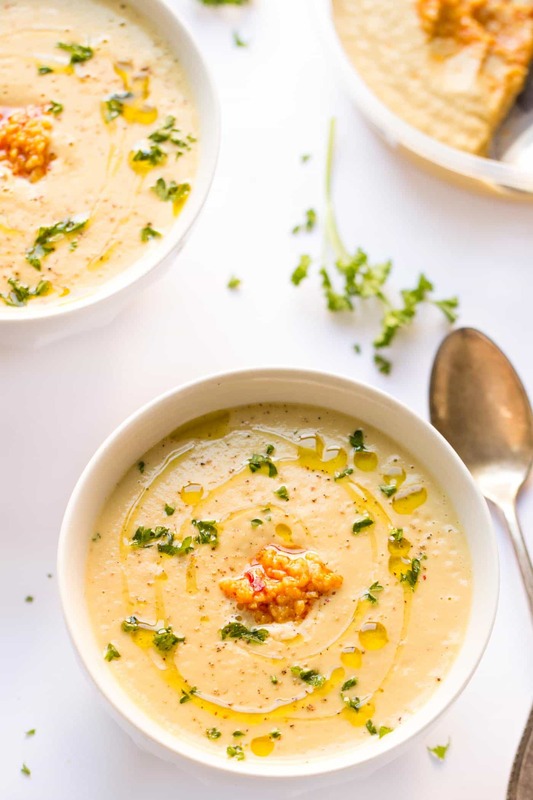 Not only does this particular variety totally enhance the garlic flavor of the chowder, but the hummus also helps make the soup super smooth AND super nutritious. By adding in a mixture of hummus and cooked quinoa (which I obvi LOVE adding to pureed soups), you are able to crank up the plant-based protein content, which will make it much more filling and satisfying. Perfect for game day when there are likely lots of hungry guys around. amiright? Okay, but football aside, this soup is on point. 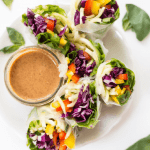 It comes together in 30 minutes, is filled with plant proteins, is vegan AND it’s got a ton of flavor. Oh and if you’re like me and need something to dip in your creamy soups, I’m all about using my mini quinoa pizzas (just the base!). They’re the perfect dipping vessel. So bring it on winter. I’m ready for your worst! While cashews are soaking, preheat the oven to 425ºF. Chop cauliflower into florets, and peel and chop the potatoes. Arrange on a baking sheet and drizzle with about 1 1/2 tablespoons of oil. Season with salt and pepper. Roast for 20 - 25 minutes until the cauliflower is starting to brown and the potatoes are soft (they don't have to be totally soft because we'll be blending them later). Check the garlic after 15 minutes to make sure it isn't burning. Allow the veggies to cool slightly then add them to a high powered blender. Squeeze/spoon the garlic out of skin and add it to the blender as well. This post was brought to you in partnership with Sabra. They're one of my favorite hummus brands and I've lately been really into their salsas and guac too. Thank you so much for supporting the companies that help me continue to bring you tasty recipes! Great looking recipe. I often make soups ahead of time so that the flavors can come together better. Would you recommend for this one. If so, would you completer some of the steps upon reheating? I would just make the whole thing and then heat it up when you’re ready to eat it! A friend gave me a portion of this soup. I’m trying to figure out what the serving size is. Can you tell me approx how many cups a full portion makes? Looking forward to trying this tomorrow night for dinner. TIA! Probably it’s good, just with like 10% of the garlic used, maybe even less than that. We do like garlic. I usually add more that the recipe says. One good thing about this soup is that now when he argues with me, I tell him “stop or I’ll make The Soup”. :)) I made it last night and no one liked it at our house either. Btw, we are used to different flavors and eat lots of vegan dishes but this one didn’t work out for us. Will this work without cashews? Alyssa! This is insane amazing! I am super impressed. It was so easy and all the ingredients were easy to find to find at my local Fred Meyer. I put mine in a sourdough bread bowl. We aren’t vegan or vegetarian so this was just extra special yumminess for us! It will become a dish I’ll make when i want to impress company in the fall months! I love it! Could the cashews be left out? Would that alter the consistency or flavor too much? I have a step daughter with a nut allergy so cannot have or use nuts in my house. Did everything the same except used a different brand of hummus (don’t like Sabra’s politics). Came out great! 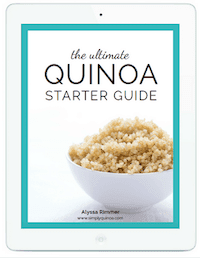 I like the addition of quinoa blended in – great idea! For some reason, I had to roast my garlic for about 20 min longer. Alyssa, I just found this recipe and would love to try it but I don’t have any miso. What’s it for? Can I leave it out? I would hate to buy it and never use it again. I made this last week and it was delicious! Definitely making this again. So creamy, thick and so very tasty! This looks amazing! I have never cooked with miso before and. I was wondering what typeof miso/ colour of miso to use?! I like white miso personally, but either would work! Quick Question … Why do you soak the cauliflower?? I’ve been cooking for years and I’ve never seen that instruction. I’m making the soup tonight. Not cauliflower, but cashews 🙂 Those are what are being soaked so they’re easier to blend! I think you could either leave them out completely or potentially use some coconut milk/heavy cream! I was in love until I checked the sodium. 49% is a little too high to be heart safe. But I can fool with it. You are doing an awesome job, Thank you!! These nutrition facts can be a bit finicky when using things that come from containers. I would say it’s definitely less than what it says here, but much of it is likely coming from the miso! Love the idea of the cauliflower! Wow! I am surprised at how good this soup is! A definite repeat. I had to take a break to write this before getting a second bowl! So glad you enjoyed it, Kassie!! Looks amazing! Is the Miso paste required? Not required, but definitely adds a ton more flavor! Hi! Just made this for dinner and will be making again very soon! Absolutely delicious! Mine turned out light brown, not the light salmon color that’s pictured. Any idea why? I followed recipe and didn’t deviate from the ingredients. I’m so glad you enjoyed it! Maybe the brown was because the veggies were a bit more roasted? I’m glad you still enjoyed it though! I was so excited to make this but that IS WAY TOO MUCH GARLIC!!!! DO NOT USE AN ENTIRE BULB. My chowder came out inedible. The consistency was alright, but I’m going to have to cut it in half and use more broth and figure something out. I like the other commenter’s idea of using it as an Alfredo sauce. I’ll add more nutritional yeast and try that! Sorry it was too much for you! I think it really depends on taste buds as I personally could go with even more garlic 🙂 Let me know how the alfredo sauce turns out! I just made this soup and it is AMAZING!!!! I think you could leave it out to be honest! This is soooooooo delicious! I either add paprika or tabasco when I serve it to give it a little more punch. I’m so happy I’ve found a vegan chowder that my husband likes! YUM!! I always add a little hot sauce on mine too 🙂 Makes it taste SOOO good! My husband and I just made this and loved it. We also added some pine nuts with added a nice crunch. It did take us more than 30 minutes to make however. Probably more like 50 mins. So glad you both enjoyed it! I love the idea of pine nuts on top 🙂 YUM! I love your recipes. This Cauliflower Chowder looks delicious. Do you think it’s something I could try in the crockpot? I think so! I just haven’t tested. You’d probably want to cook everything together for at least 4 – 6 hours and then blend it up! 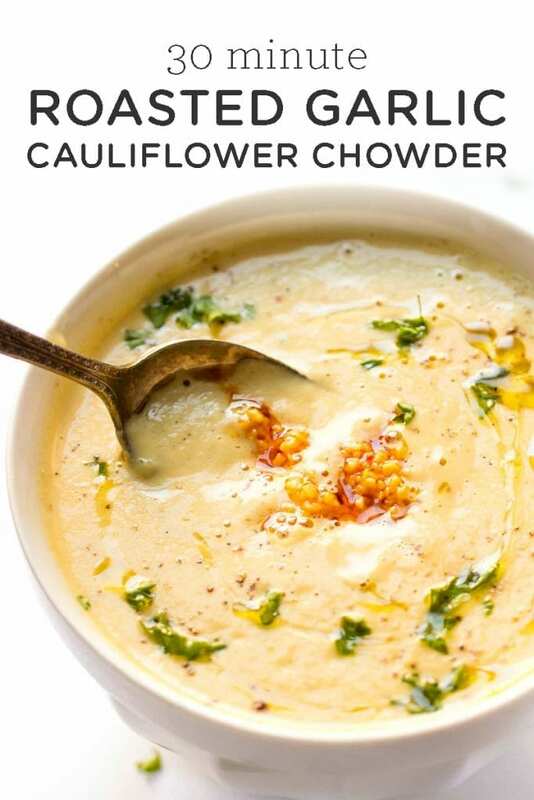 This recipe was simple and delicious!Roasted Garlic Cauliflower Chowder This looks incredibly good That is exciting! I am so happy for you! Regardless, the recipe was awesome! Thanks so much! I would love to serve this for about 10 – 12 friends that gather together twice a month. I love the convenience of a slow-cooker, is this recipe possible made this way? This recipe sounds divine! This is genius! I love sneaking extra veggies into soups, but this sounds so delicious it isn’t sneaky at all, I want to shout from the rooftops. Adding hummus is particularly brilliant, I almost always have some left from making a big batch that I can’t eat quickly enough. Will have to try this asap. This may seem like a dumb question but when you add the quinoa, do you have to cook it first, or do you add it raw? I used cooked in this recipe! Hey lady!! Meal planning for the week and came across your recipe. 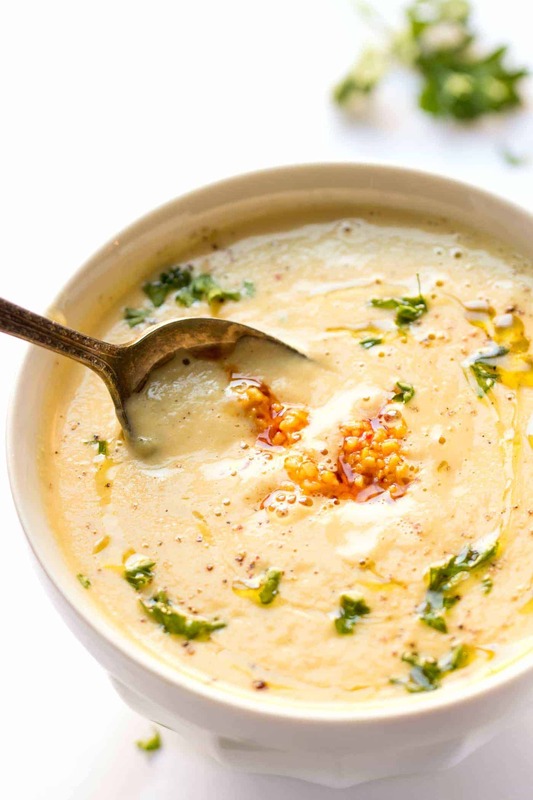 We love cauliflower chowder and have always used northern white beans. I can’t wait to try it with hummus! Soccer starts up next week and I need some quick and healthy ideas for my crew. Have a feeling this will be on rotation around here! What might happen without the oil? How much cauliflower? The heads all vary in size. I would say a medium head, about 5 – 6 cups of chopped florets! Soup tastes incredible btw. Worth the time. If you have a high powered blender, you don’t need to soak them actually! Eating this delicious soup right now! Thank you, it’s a heavenly recipe! thanks for the recipe! We loved it, kids, not so much 😉 The only change I made was that I kept some (¾ cup?) of the small florets out of the blender, and just added them to the soup (roasted), to give it some chunks, only because I don’t like perfectly smooth soups. Nice healthy soup, really comforting! So glad you enjoyed it! 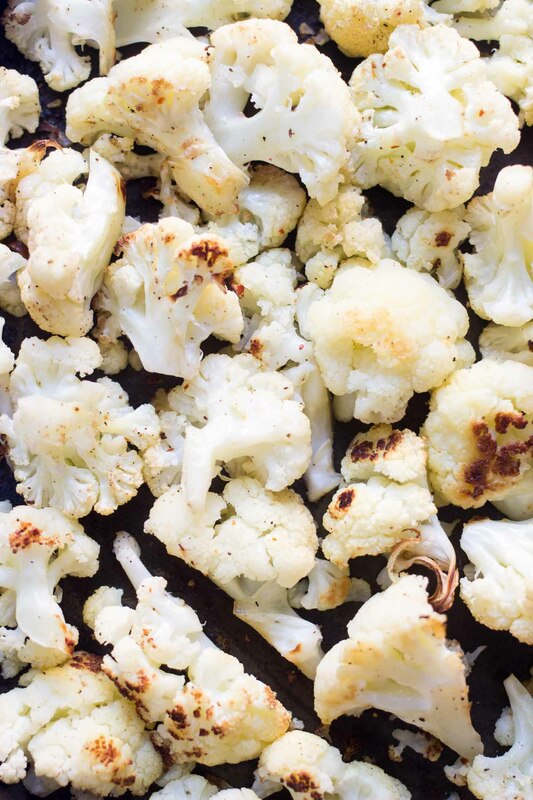 And adding in those chunks of cauliflower was genius! This IS delicious…but the title is INCREDIBLY misleading. Nothing that requires roasting and a two-hour soak should be referred to as a thirty-minute meal. If you have a high powered blender (like a Vitamix or BlendTec), you can actually skip the soak 🙂 Glad you enjoyed it! If you have a high-powered blender, it definitely can be 🙂 You won’t have to soak the cashews at all! 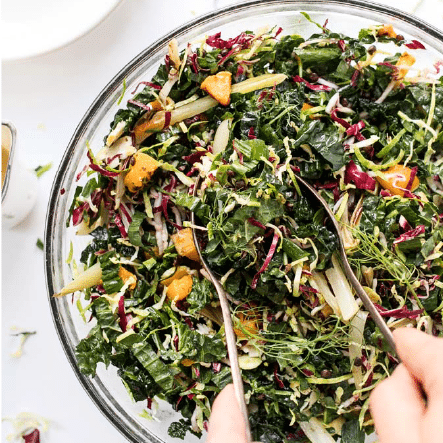 I’m neither vegan or gluten free but this looks great and I’m looking forward to whipping it up! I have a question about the Miso paste. How essential is it to the recipe? It’s the only thing I don’t have on hand/use regularly and I’m not sure I want to pick up some. Also, an immersion blender should do well for this, yeah? An immersion blender would definitely work! And the miso paste is not technically essential, but it adds some really great flavor 🙂 You can skip it and just add a little salt! Made this twice now; fantastic although I cut down the amount of garlic second time around. Truly excellent! So glad you enjoyed it, Steve! This looks yummy! I cant wait to try it. It’s perfect for the cold rainy weather. So yummy, comforting. I will definitely be making this again and again. Thanks! I made this yesterday in preparation for our first snow in Boston, and HOLY COW it’s so good! Really hearty and enough to last us for 2 meals. I only had about 6 cloves of garlic on hand, but will definitely be using way more next time. Currently making your pumpkin chocolate chip bars! Thanks so much for making healthy cooking seem less daunting; you’ve dragged me out of my same-meal-everyday funk and inspired me to food prep for my long work weeks. I appreciate it! The bars turned out GREAT! They’re not super sweet, and helped me power through a crazy week at work. I made your Autumnal Buddha bowl for dinner tonight in an attempt to detox after a carby weekend- SO good! Keep em coming, girl! Tasty, but mine came out pretty thick. Also, I don’t see how you could possibly make this in 30 minutes. 20 to 25 minutes to roast the vegetables, plus 10 minutes for “prep” gives you at least 30 total right there. Add time for blending, etc. Took me about an hour. This looks SO good and I will definitely be making it as-is at some point if for no one other than myself 😛 I do have question though. My partner has digestive issues that are aggravated badly by garlic… is there another aromatic that you would recommend with the flavors of this soup that isn’t onion or garlic? It’s great that it’s not dairy-based, he can’t have any milk (even commercial plant milks don’t go over so well). Looking forward to whipping some of this up when the snow flies! I am definitely going to give this a try! Loved reading through your writing, Alyssa! This was sooooo flavorful and delicious. Thank you for sharing this unique recipe. I used a food processor, had a bit of a mishap when I added the liquids. Whoops! But it still turned out great. I added some red pepper flakes for kick. Question – I have a vegetarian friend (not vegan) who is allergic to nuts. What’s a good cashew substitute? I just made this today and had my first bowl. I knew i would love when I saw recipe. It was so good, comforting and delicious!! I didn’t have miso so added Worcestershire sauce and did use chicken stock instead of veggie broth. I roasted my garlic bulb longee than cali and potatoes, just to make sure it was soft and roasted. Best recipe I’ve made im quite some time!! Just wondering if there is a subsitute for the hummus? I think you could either leave it out or add in another potato! Especially when cooking pumpkin soup. With a good (a very good 😉) piece of ginger it is just perfect for cold and rainy days!! MMMM pumpkin soup sounds lovely! It’s not only crazy ingredients that can boost the health-factor of your recipes, it can also be in the preparation. Because you’re using a cruciferous vegetable, cauliflower, you should be using the ‘hack & hold’ technique: Chop it up a bit and let it sit 40 minutes for glucoraphanin to mix with the enzyme myrosinase (activated by rupturing the cell walls) to create the cancer cell suppressing compound sulforaphane. The precursor enzyme (myrosinase) is easily destroyed by heat, but the final product is not. Marinating in lemon juice will catalyze this effect. This sounds heavenly and I can’t wait to try it! I can’t have miso paste (soy messes with my thyroid) so I’ll probablyswap that out with tahini paste. Is there a good vegetarian protein you can recommend in its place? Can you have chickpeas? You can buy chickpea miso and it’s just as tasty! This is not good, looks like watery oatmeal. I am usually a good cook, I don’t think I’ll be able to sell this one to my family. I wish I would have just eaten the yummy roasted vegetables. I think this whole pot is going down the drain. Your recipe instructions refer to POTATOES. But the recipe calls for one?? Is that right? I just want it to turn out right. Thank you! I was just wondering why the hummus and quinoa were not mentioned in the recipe? Also, how much of each? 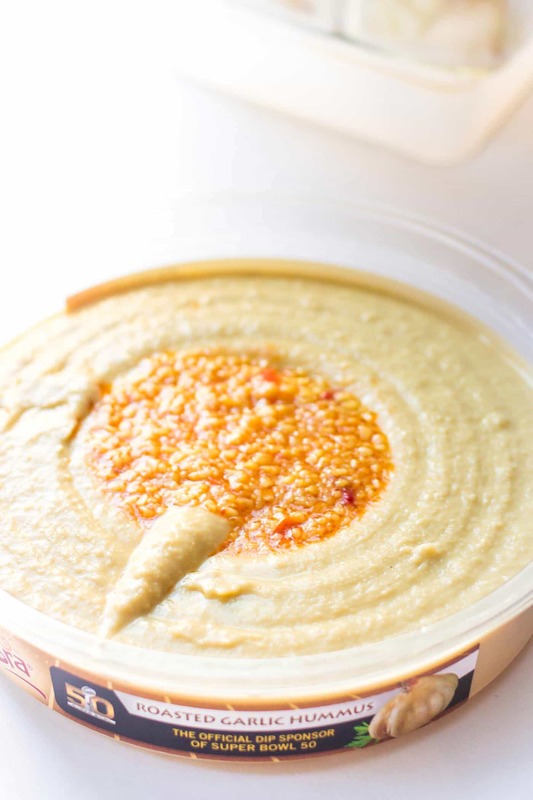 They’re both in the ingredient list 🙂 ½ cup Sabra Roasted Garlic Hummus & ½ cup cooked quinoa — enjoy! 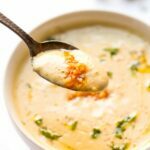 I’ve made a bunch of roasted cauliflower soups from recipes online and this is definitely the best! The miso and hummus add great depth of flavor! So glad you enjoyed it! The miso is such a great addition! What kind of miso did you use? Hi Alyssa! Thanks for the recipe! I tried it last night and it is wonderful. I had a question though… My chowder didn’t come out completely smooth. I had to use a ninja, I don’t have a blendtec or a vitamix. Do you think that’s the problem? Does yours come out completely smooth? Any suggestions? Thank you!! I only have a cheap food processor, and it just takes longer. Given the small capacity, I had to blend in two batches as well, but I was amazed how velvety smooth it turned out just by letting the machine run on high speed for several minutes. Good luck! 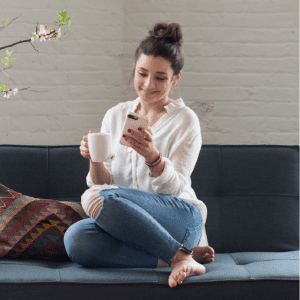 Alyssa – great idea & recipe! We enjoyed it. Adding quinoa and hummus to soup is brilliant. Thanks for teaching me a delicious and healthy new trick! So glad you enjoyed it Tiffany and thanks for the tip about the food processor! I found your recipe/blog through Pinterest. Wow, I made this tonight and it was amazing. Alyssa, my husband was so impressed he said he’d like to shake your hand. 😄 And he hates quinoa. For anyone that’s interested I worked up the calories. For the whole pot it was less than 1200 calories. I think I’ll figure out the protein next. I’ll definitely be following you! 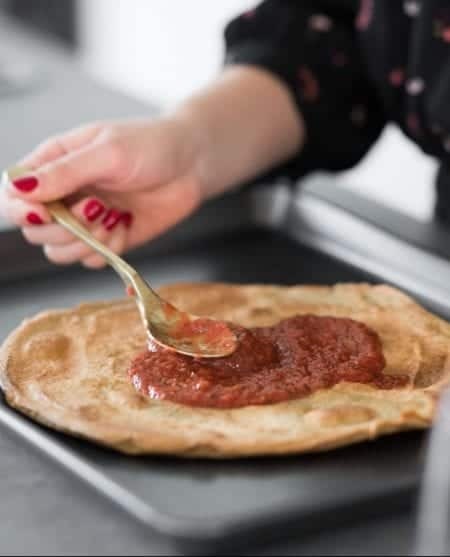 I’ve been making this recipe on a weekend and taking it to work for lunch…even thought it’s summer, it’s too delicious. Can I saute the veggies because my oven is not working? Can you recommend a substitute for the hummus? I can’t have chick peas? I think you could just leave it out to be honest! I made this last night and it was delicious!! So incredibly good. My husband and especially my son, really really enjoyed this as did I. Definitely making this again. So creamy, thick and so very tasty! Any suggestions for a nut-free family? I’m thinking I increase the hummus, or maybe just reduce water. Hmmm…. You could also try adding hemp seeds! This recipe looks delicious! I’m definitely going to give it a try. Thank you! I just made this today – Here is my opinion…I think an entire bulb of garlic is way too much (I didn’t use the whole bulb). I don’t think I could just eat this as a bowl of “chowder.” With that being said, I made pasta and used this like an Alfredo Sauce!! I loved it! I will make it again utilizing less garlic. I think it’s perfect over Pasta!! I was so excited to make this but the batch was ruined by the overpowering flavour of garlic!!!!! I used half of a small bulb and it was still too much. I ended up having to make another batch without garlic and added some of the original batch in. Please adjust your recipe, maybe recommend that they start with a few cloves to taste before entering any more. Thanks for the feedback! I definitely think it’s all about taste buds here. We’ve gotten tons and tons of rave reviews, but others have said it’s too garlicky. I’ll make a note in the recipe right now! Haha I’m the same way 🙂 xo! Thanks for the feedback! Love that you used it over pasta, that’s genius! How many cloves of garlic do you suggest because I’ve seen huge bulbs and tiny bulbs? a whole garlic bulb has now blinded me, I think I lost my sense of smell, and purpose in life. Just being funny. hahahaha. please revise that part of the recipe, dear god. I actually did use a whole bulb, but you can certainly take it down if need be! Do you have the nutritional information on the soup. Hmmm you could try squash? Or just leave them out and reduce your liquid! Would sweet potato work in place of regular potato you think? Lentil tacos! I cook lentils, unseasoned, just shy of done (about 10 minutes short) and then drain the beans and use them instead of ground beef with taco seasoning. They are magical! What does the nutritional yeast add? Is there something I could substitute? Thank you. I was worried I need the yeast. I made this and it turned out super thin. Any suggestions on how the thicken it? Did the cashews blend all the way? You can also stir in some more hummus or a really thick version of cashew cream! Any suggestions for a cashew substitution? My youngest is allergic to all tree nuts. He can eat peanuts. What do you think about adding those? This was great. Totally surprised by the humus. I didn’t have cashes but I did have a dream blend of almond, cashew and hazelnut drink that I added to the soup in place of the water. I also added a little cayane pepper. My husband love it also. I thought the taste or texture would turn him off, but he truly enjoyed it. Just add some good toasted bread and maybe a salad of some sorts and perfect. Thank you. Wondering if you can give me an estimated serving size? Can this be frozen? What can you substitute for the miso sauce? ER MER GERD. SO PRETTTTY! I wrote this down to try!! This chowder looks wonderful! For me, since it is a chowder I think I would add some frozen corn to it! But, of course, that is just me! This looks really good! So creamy! we are nut free house can i exclude the cashews or will that ruin it? 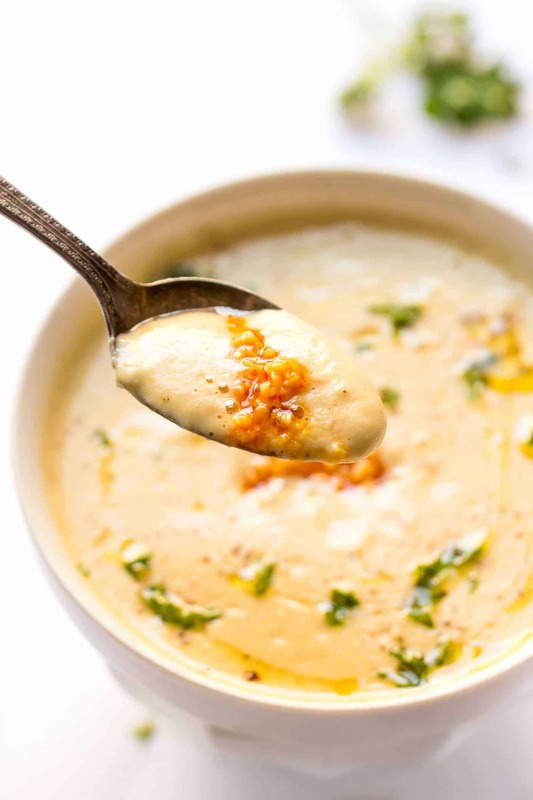 This is a delicious soup,extraordinarily creamy and flavourful. To up nutrients I add roasted yam and a carrots and some red pepper in place of the potato and for a little more kick i add extra red pepper and some thyme or rosemary. I plan to experiment using other veggies. Love those additions, Suzie. Thanks for sharing! I made this yesterday as it is getting quite cold in Canada! It is fantastic!! I may have put a tad too much miso in it, but I absolutely love it! Thank you for the recipe!! I was wondering if I could use a food processor or something other than a blender to make this soup? i just tasted this after whipping it up in my blendtec. aahmazing!!! i am gonna drown baked potatoes with this and stuff em with extra little bits of cauliflower i saved from the roasting and some steamed broccoli for dinner. super protein packed soup and deelish! !